In Science class we went out to the Oxbow pond and Coquitlam River to study about water quality and invertebrates in our sphere’s unit. On the first day I got to put on chest waders and used a thermometer to check the temperature of the water, I had to hold the thermometer in the water for 3 minutes to get a more accurate result. After that I grabbed a sample of water and we put a liquid in it which changes the colour of the water to show how basic or acidic it was. Then we brought the water inside to compare the colour of the water to the sheet showing water quality from 1 to 10 and found out that the average between all the groups was 6.8 out of 10. Once we got the results we could tell that the water wasn’t completely basic or acidic and that it was close to the middle between the two. After finding out about the PH and temperature we found out about everything else about the water showing that the water is good quality at an average Water Quality index of 80.2. 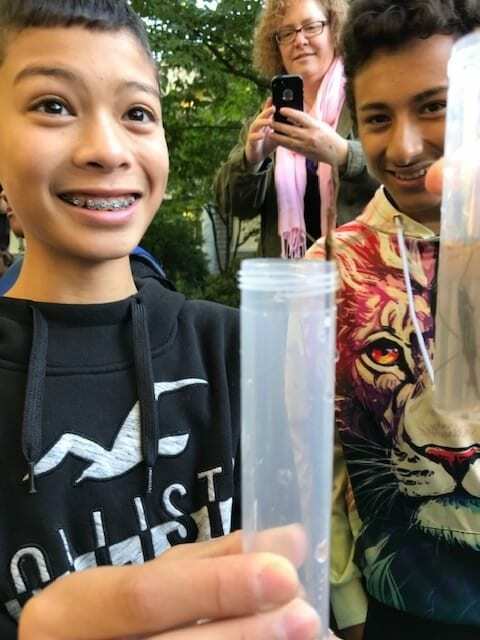 For the Coquitlam River the Block C class took the same steps to get the over all water quality of the water and found that it had an average Water Quality Index of 87.2. After we got the Water Quality index for both the Oxbow Pond and Coquitlam River we found that the Coquitlam River had better quality water then the Oxbow pond. On the second day at the Oxbow Pond we got to sample invertebrates from the edge of the water. We scooped out a bucket of water from the pond and brought it to the shore to look for invertebrates. Once we checked the whole bin of water for invertebrates we only found a couple, one being an aquatic worm. We also found a lot of vertebrates like a stick bug and fish. Other groups also found other invertebrates like a damselfly nymph, riffle beetle, planarian, and water penny’s. After we finished at the Oxbow Pond we got to look for invertebrates in the Coquitlam river. Our group mate went to the flowing part of the river and put a net between their legs while scraping rocks, so everything scraped of the rocks would go into the net. Then we put everything in the net into our bin of water from the river and started looking for invertebrates. At first, we couldn’t see anything in our bin but after a couple of minutes we noticed there was a very small invertebrate swimming around in our water. Once we saw it we grabbed our invertebrate identifying booklet and it turned out it was a Mayfly. The Mayfly was the only thing we found but other groups found a lot more like Stonefly Nymphs, Larvae/Nymph, and an unidentified invertebrate. Comparing what we found at the Oxbow Pond and the Coquitlam river I noticed we found a lot less stuff in the Coquitlam River then we did in the Oxbow Pond. During these days at the two sites I learned that water quality effects the diversity of aquatic invertebrates greatly. In Better quality water there is more variety in aquatic invertebrates and in worse quality water there is less invertebrates because they need to be able to survive in worse water conditions. I also learned that any type of invertebrate can live in good quality water and only invertebrates that aren’t pollution sensitive can live in worse quality water. When we were doing these studies at the Oxbow Pond and Coquitlam River I had a lot of fun and it was cool looking at different invertebrates in real life instead of just pictures of them. During these studies I learned a lot about invertebrates and safety while wearing chest waders in the pond and river. This Study would have been more meaningful if we were able to find more invertebrates in the water because we only found a couple throughout the days at the pond and river. Copyright © 2019 Enzo's Blog. Powered by WordPress. Theme: Ample by ThemeGrill.